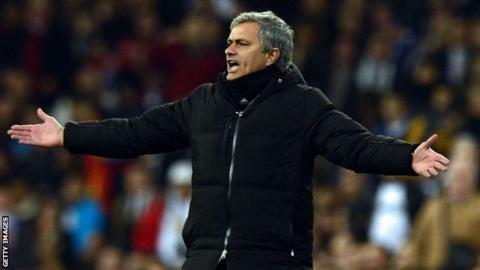 saw his Real Madrid side come from behind to draw the first leg of their Copa del Rey semi-final with rivals Barcelona. Barca took the lead after a goalless first half at the Bernabeu when Lionel Messi played in Cesc Fabregas, who calmly fired past debutant Diego Lopez. Cristiano Ronaldo then sent a stooping header just wide as the hosts pushed for an equaliser. The reply finally came when the impressive Raphael Varane headed home. It was the visitors who had come closest to opening the scoring in the first half when Xavi's free-kick hit the bar after 20 minutes. He had a second chance after a poor backpass by Ricardo Carvalho, but 19-year-old defender Varane rescued his veteran partner by clearing off the line. The league leaders deservedly went in front, however, when Fabregas fired home after 50 minutes. Only a brilliant Gerard Pique tackle denied Ronaldo a leveller, but the goal the hosts sought came with nine minutes remaining through former Lens defender Varane. The second leg is at the Nou Camp on 27 February. The other semi-final will be contested between Atletico Madrid and Sevilla.